Such is my experience today as I inauspiciously rediscovered the music of Dave Holland, for I was just thumbing through a dusty stack of vinyl wondering why I would ever let that stuff take up my valuable real estate. 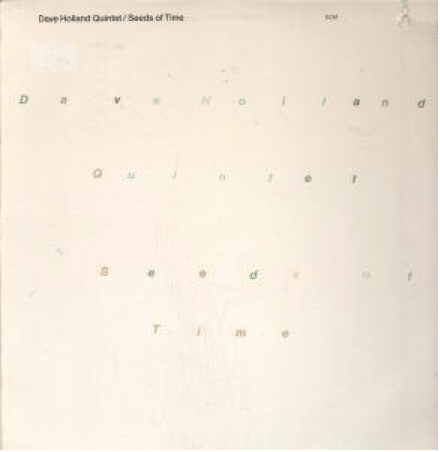 Seeds of Time was my favorite album for a while in the late 80’s; it’s a quintet date from 1986 on ECM which features a young Steve Coleman and Julian Priester, Kenny Wheeler and Smitty Smith, and to my ears then seemed (and still is) impossibly hip and free, while also having that ethereal “ECM vibe” which is a “time and a place” for those of us who were digging acoustic jazz in the 80’s. In school, a few years prior, I had written a piece for chamber ensemble which featured acoustic bass and percussion in the ensemble, and was partially inspired by the pizz playing on Holland’s solo record Emerald Tears, particularly his rendition of the Anthony Braxton tune “B-40/Rs-4/M23-6K”. My friend had transcribed it and played it on a recital. I thought it was a really cool treatment–sort of reminded me of the Bach ‘Cello Suites, where one voice can cover a full range of sound, and after a minute or two a solo instrument sounds like an ensemble. Dave’s sound has always been full and rich, and beginning with Seeds of Time I was taken by not only his sound, but his writing and the free and easy sound of his ensemble. I then somehow got turned on to NYC bassist Mark Helias and other NY’ers, particularly Helias’ record The Current Set, again on vinyl in 1987, which had much of the same vibe. I notice that all these records are reissued on CD: Helias’ in 1993, Mr. Holland’s opuses in the early 2000’s. I like the sound of the vinyl though, and frankly, hearing a record from beginning to end, having the visceral connection with the source of sound (not just the cool sound waves, but having to get up and flip it over) is something that has become more important as the lossy mp3 format invades my music space. As a composer I learned from Dave Holland how to fill sound space without piano, and seeing him live and loud in NYC many times really drove home the point that you don’t need to flesh out every orchestrational opportunity; space can be filled up by anywhere from one to tutti instruments, and even if nobody is playing your brain can fill in the sound space for a while. I also really dig the post-bop post-modernism approach to harmony: linear, heavily influenced by Ornette. It’s soloistic, free, and melodic from the ground up and the top down. Without chords the melodic line and the counterpoint will set you free. I will cross-post this and eventually provide some analysis of Holland’s technique in my comp blog professorscosco when I get a minute. I have a few posts in the pipeline that need to be finished first. So dig upon the NYC 1980’s ECM sound. So much of what we do today started then, and I feel like I’m still chasing the vibe that Dave Holland seems to effortlessly achieve. Peace out.